A little girl was walking in the forest and heard a loud growl. She was suddenly met by a big bear. The little girl awkwardly climbs his legs, bumps him in the nose, pokes his eyes and sticks her foot in his mouth. Alas, she made it to his shoulders. The bear let out a big sigh, both one of endearment and patience. As the little girl held on to his neck, the bear ran through the forest. She laughed with glee, “This is fun. Faster, faster!” The bear sped up, jumping over fallen trees and sliding down muddied hills. He reached their first destination, a river bed. LESSON #1: I will teach you to choose nourishment. The bear led the little girl to the edge of the river. Staring intently into the rapids, he quickly swooped his paw into the cold rushing waters and retrieved a salmon. LESSON #2: I will teach you to mark your territory. They soon arrived at their next location, where they were surrounded by tall redwood trees, sword ferns and countless violets. The bear walked over to the tallest, biggest redwood tree. “You like this forest?” he reiterated. “Oh yes. I think it’s perfect!” she exclaimed. All of a sudden, with eyes closed, he leapt into the air and clawed the redwood that stood before him. As his paws touched down, he exhaled deeply, with eyes still closed and head bowed. A silence drifted through the trees. They sat under the marked tree, the little girl nestled into his chest. With a twinkle in his eyes, he smiled and off they ran to their next adventure. LESSON #3: I will teach you to rest. It was dark. Very dark. “Stay close to me, Little One. Hold my paw as we walk.” The bear moved carefully inside the unlit den. Before he could finish his sentence, the bear heard gentle snoring sounds and a rhythm of deep sleep. LESSON #4: I will teach you to stand firm. As the little girl awoke from her rest, letting out a big yawn, she walked towards the entrance of the den. Outside, the bear had dug a hole, placed large rocks in a circle and was lighting the kindling he had gathered. A bag of marshmallows was beside a tree stump, along with a whittled branch. “Yummy! Thank you, Bear!” The little girl sat down on the stump and began to roast a marshmallow. He stood on his back legs and he grew taller and taller, towering 8 feet tall. 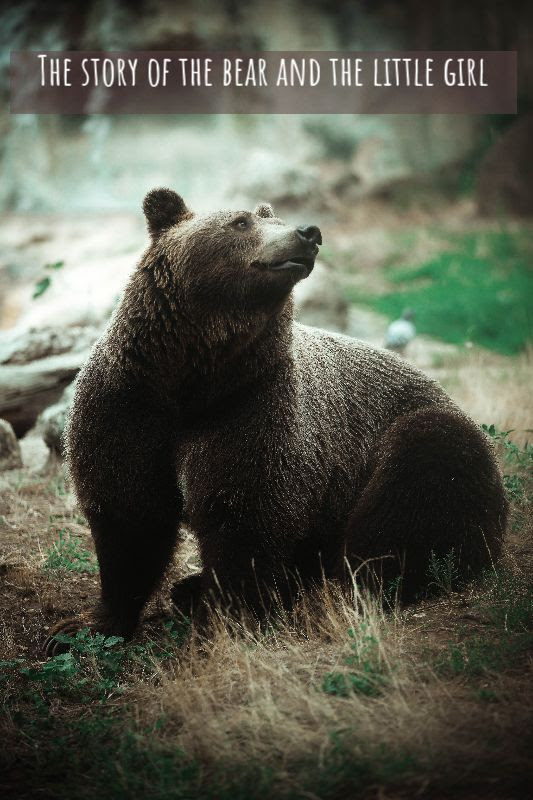 With his front paws stretched, the big bear let out a bellowing roar. The birds in the trees fluttered away and you could hear the sound of rabbits and critters scurrying off. The little girl covered her ears, his roar was like thunder. As the sun began to set, the bear and little girl walked hand in paw back to her home.